The Dow Jones Industrial Average is higher Monday amid improved prospects for a trade deal between the U.S. and China. The Dow Jones Industrial Average was higher Monday amid improved prospects for a trade agreement between the U.S. and China. General Electric Co. (GE - Get Report) rose 6.1% Monday following a report that suggested Apollo Global Management LLC (APO - Get Report) could be preparing a $40 billion bid for the company's airplane leasing division. Eli Lilly & Co. (LLY - Get Report) reached an agreement to buy biopharmaceutical company Loxo Oncology Inc. (LOXO for $235 a share in cash, or about $8 billion. Stocks rose on Monday, Jan. 7, following Friday's rally that was fueled by much stronger-than-expected U.S. jobs data and dovish messages from the Federal Reserve. Giving equities a lift Monday were improved prospects for a trade agreement between the U.S. and China. The Dow Jones Industrial Average rose 98 points, or 0.42%, to 23,531, the S&P 500 rose 0.7%, and the Nasdaq was up 1.26%. Trump and Xi reached an agreement Dec. 1 to postpone further increases in tariffs. General Electric Co. (GE - Get Report) shares were up 6.1% Monday following a report that suggested Apollo Global Management LLC (APO - Get Report) could be preparing a $40 billion bid for the company's airplane leasing division. Eli Lilly & Co. (LLY - Get Report) reached an agreement to buy biopharmaceutical company Loxo Oncology Inc. (LOXO for $235 a share in cash, or about $8 billion, in the second major pharmaceutical sector deal of the year. 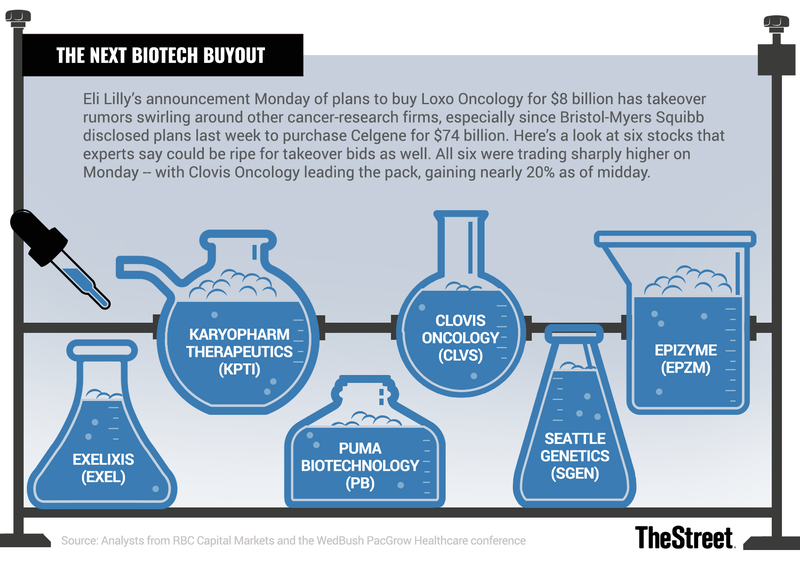 The price represents a 68% premium to Loxo Oncology's closing price of $139.87 on Friday. The transaction isn't subject to any financing condition and is expected to close by the end of the first quarter of 2019, the companies said. The takeover comes just days after Bristol-Myers Squibb Co. (BMY - Get Report) agreed to buy Celgene Corp. (CELG - Get Report) in a deal that values the company at $74 billion. "We are excited to have reached this agreement with a team that shares our commitment to ensuring that emerging translational science reaches patients in need," said Jacob Van Naarden, chief operating officer of Loxo Oncology. "We are confident that the work we have started, which includes an FDA approved drug, and a pipeline spanning from Phase 2 to discovery, will continue to thrive in Lilly's hands." Eli Lilly shares rose 0.6%, while Loxo Oncology shares jumped 66% to $232.65. Other stocks in the sector also were rising -- Clovis Oncology Inc. (CLVS - Get Report) was up 18.5%, and Epizyme Inc. (EPZM - Get Report) rose 5.8%. Amazon.com Inc. (AMZN - Get Report) was up 3.4% to $1,629.51 after analysts an Pivotal Research initiated coverage on the stock with a price target that suggests more than 20% upside potential for the world's biggest online retailer. Pivotal analyst Brian Wieser pegged a year-end price target of $1,920 a share for Amazon as he initiated coverage of the stock with a "buy" recommendation based on the company's retail activities as a play on global consumer spending, which some estimate at nearly $45 trillion. Pivotal also sees Amazon's advertising business, which generated around $9 billion in revenue last year, as having the ability to provide "incremental growth" that's independent of consumer spending. "Amazon is one of the world's largest retailers (with a sideline in fast-growing and high-margin advertising activities) and also owns one of the world's largest software businesses," Wieser wrote. "Despite its current massive size, we see Amazon's opportunities as mostly unconstrained based on a successful track record of capitalizing on consumer and IT department spending." Tesla Inc. (TSLA - Get Report) broke ground for a factory in China and will start production of its Model 3 and a planned crossover - the Model Y - by the end of the year, CEO Elon Musk said Monday.